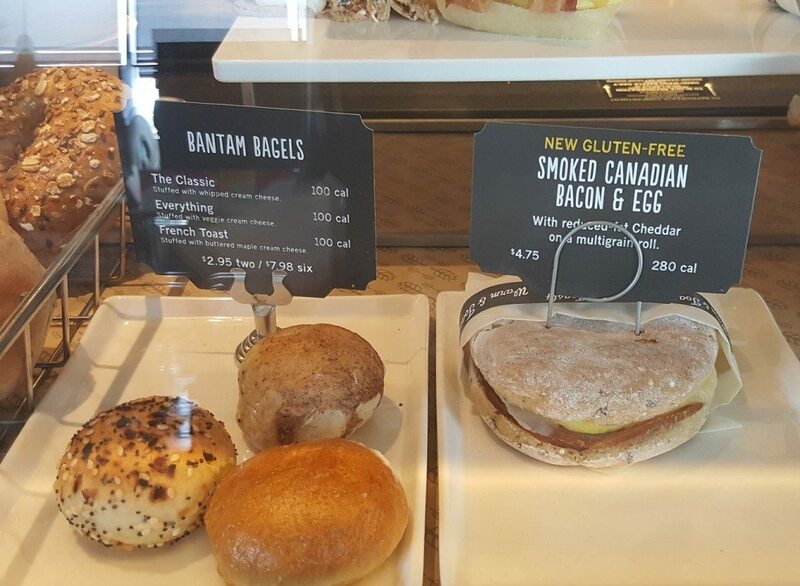 Looking for a gluten free breakfast sandwich at Starbucks? There are 350 stores that have them. You’ll find them in locations throughout San Diego County, California, and in greater Miami, Florida. 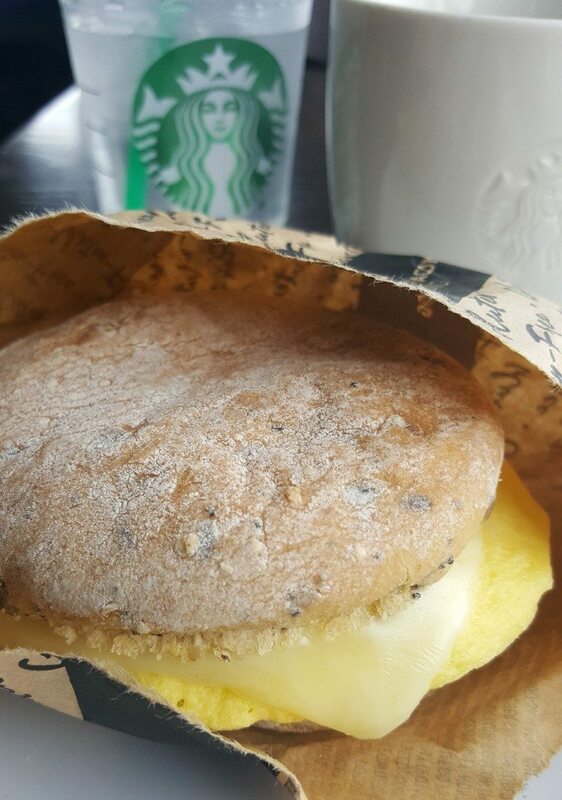 According to Starbucks media relations, “Starbucks is currently testing a Gluten-Free Breakfast sandwich in 350 Starbucks locations in San Diego and Miami. The test started in August and runs through early October. ” So you have to run quickly to a store to get one before they’re gone! 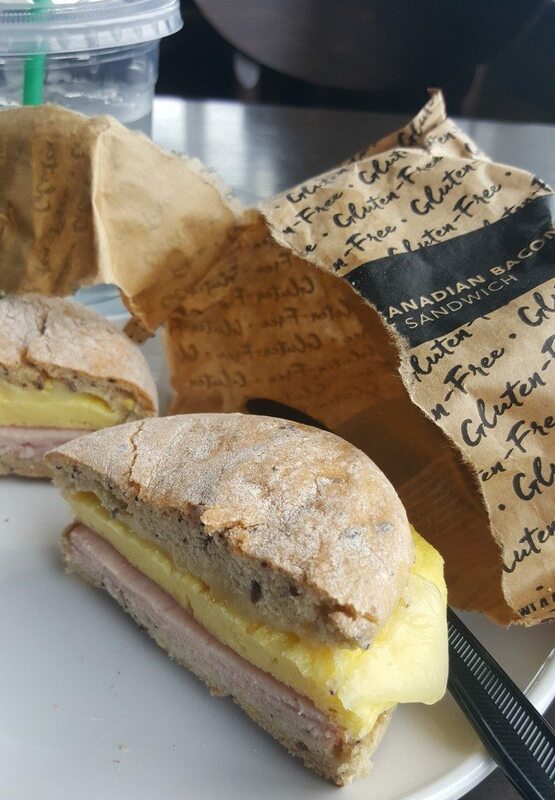 Each gluten free breakfast sandwich is a generous portion of egg, cheese, and Canadian bacon. The bread was pretty good. I did notice that it was a little powdery or dry in texture. Nonetheless, it was an excellent breakfast sandwich and I enjoyed it. I think this could work nationally! Click onto the names of the test beverages listed above to open up a StarbucksMelody story on them. Always keep in mind that Starbucks tests many more items than what actually makes it to a national launch. 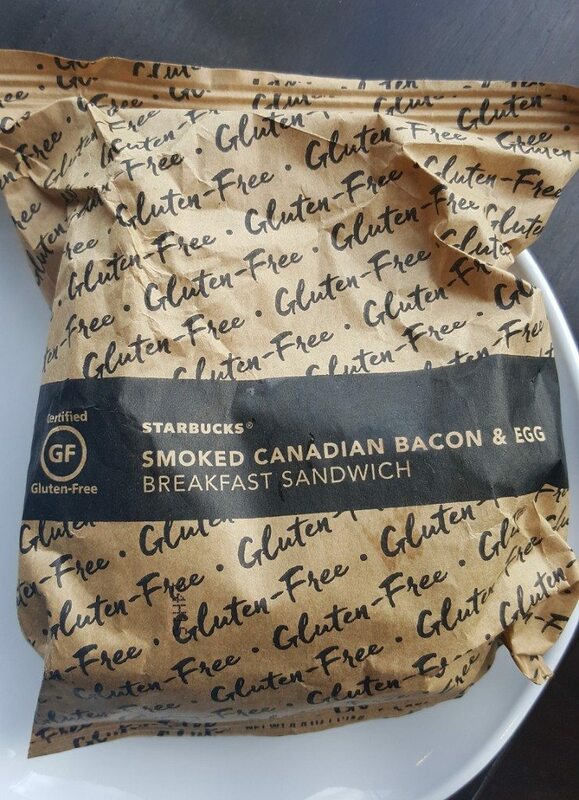 I’d love to know what you think of the new Starbucks Gluten Free Canadian Bacon Breakfast Sandwich. Don’t look!! This Starbucks Ugly Sweater Gingerbread Man Partied Too Hard. @Elisabeth B. – I think that’s been an issue in the past trying to have GF that isn’t cross contaminated. Thank you for the comment! I’m so excited! I hope this is successful so GF will be available at all Starbucks. So glad to see the individual packaging! No hope for my store then, we still do not have almond milk. Why not consider the North East for your test? I’m surprised by the two locations you choose. Did the data showed them with a higher concentration of celiac disease….? I still hope that Starbucks will offer some gluten free drinks beyond plain coffee and milk( or coconut milk) combinations. Please consider offering a mocha, vanilla or even some tea drinks that would allow GF folks some options. Definitely WANT and need here in Pennsylvania!!!! Wow I thought this is a national new item. I tried it the first day it became available and it is now my favorite breakfast sandwich. Oh I live in San Diego. Please bring gluten free breakfast sandwich and drinks to the Atlanta area and surburbs. I tried it in Miami in September. I didn’t know it was a test, so at EVERY Starbucks I have been to since then (all in Central and Northern Florida) I said, “You need to get with the program and do what other Starbucks are doing for their GF customers!” So sad the test was so short and limited in area. It is a great sandwich and I hope the higher ups want our business. Starbucks replaced the food counter at my Target, leaving me very little that I could buy. I don’t drink tea or coffee. I did purchase several items gluten free there on Monday. IF that sandwich were to appear in Chicago stores, I would definetly purchase it at least once a week. This GF sandwich is SO good!! Please Starbucks, roll it out nationwide!! Bring GF farther north to Fresno/Clovis CA. It sounds delicious. You said to look for it in the pastry case and included a photo of the sandwich in the case sitting right next to bagels – uncovered-!!! How does that work??? Was the photo just for the blog? Does the sandwich actually come to the store in it’s own bag that’s sealed? I can’t imagine it not being cross contaminated unless it is made in a GF facility and then shipped to the store in a sealed bag. Do you know the details? The gluten free breakfast sandwich is fantastic! I tried it when we were driving home from Florida to Canada. Please bring this sandwich to Canada. Now when I go to Starbucks I only eat the dream marshmellow bar. Right now no other coffee shops and most restaurants provide an option for a gluten free sandwich so one ends up caring food from home but sometimes this option is not possible either. I guess it will depend on if there is a good market for the gluten free sandwich but I can’t tell you how nice it was to eat that sandwich! I have it in my local Starbucks , and wish it were everywhere!! !